Ok, so there hasn’t been a blog for a while. But did you see there’s not one but TWO new sections to the website?! We’ve got the catalogue – all the nitty gritty details of the portfolio available at the mere bat of an eyelid, and the Published section. This one’s been festering in the background for a decade or so and is finally big enough to go out on it’s own 😉 It’s not really been a specific intention of mine to have my work published, as you may know I run a hospitality based business for myself (which funds the art projects) and my art has always been purely my own – aside from commissions of course. Although I’d be lying if I said I didn’t have a soft spot for kid’s books, and I had recently decided that I’d like to have a bash at some illustration work, so it’s been hella fun working with Dave on the illustrations for Frankie Dupont. Of course the Published section will be updated accordingly, we’re expecting around August at the mo. And all of this on top of the animation thang has given us a fine excuse to get some shared studio space. It’s taken a while to move in, get settled and get pics, but I finally got there. It’s about time. So this is the technical end where clean stuff gets done. We like whiteboards a lot, and after a bit of research found that a cheap option is sheets of melamine board. They need a bit of waxing and there’s a possibility of some discolouration but they’re a quarter of the price!! As all of my messy stuff is at Dave’s in the animation studio, my space is freed up for a relatively zen painting experience. The most clutter that ever happens is CD’s and food wrappers. We’ve got a spare room to store all the canvasses I’m not currently working on. Woo-hoo! 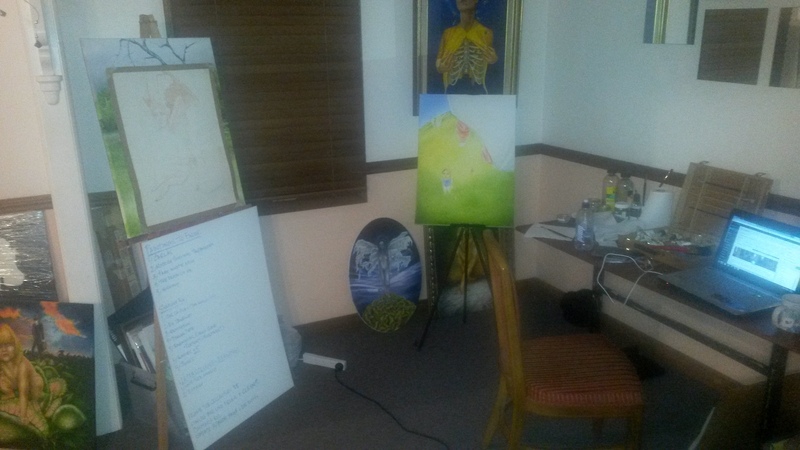 That white board is a list of paintings in various stages of completion, and some yet to make it into a sketch. There’s easily a good few years of work there and the list is constantly growing- needless to say that there WILL be some ‘work in progress’ updates coming. After the best part of a year my painting studio is finally settled again. 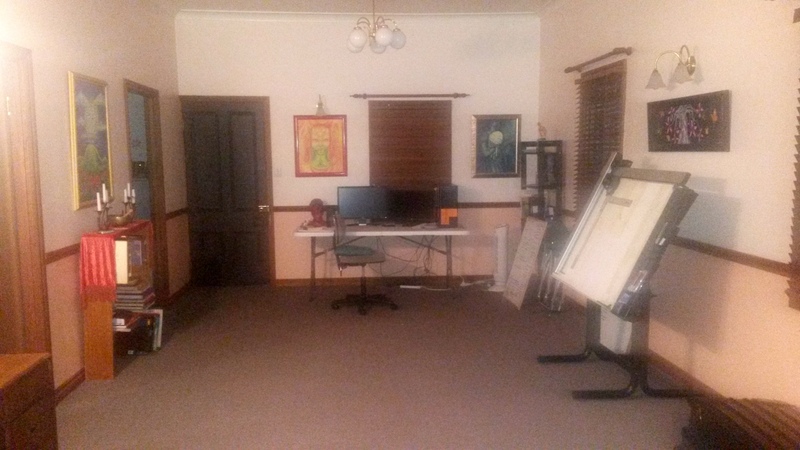 I’ve been in that room and I can confirm that it’s far too tidy for an art studio.